Trying to express one’s feelings about art works is never easy, so I’ll start with my first impression. When I see Yemisi’s animal heads, I want to greet them in the same way I would greet a real animal, and more, if it were possible, I would like to greet them as an animal would greet another animal. The sculptures bring me down to this extraordinarily intimate level. They are like meetings, I am having a conference with a wise animal, because without a doubt, they are all wise. I am certain that they communicate among themselves. Then I feel I should ask how the work operates as an art object. At this point critics usually do some research on what others have written about the work and ask questions of the sculptor to ascertain their meaning, but I don’t want to do this, I want to come to this work knowing nothing. I want to be like my ancient ancestor or one of Yemisi’s animals, who just go sniffing around to see what it can connect with. I want to know what I know just by being in their presence. There is little point coming to these sculptures without bringing your most extensive philosophical sensitivities along. So, what I am bringing to these sculptures is the sense that matter is not just a convenient filling for supposedly harmonious, but empty forms. Matter, like the marble of Yemisi’s sculpture, is filled with imaginative resonance, it can help us remember who we are, and it can act as a vessel for our soul. If we ignore the materiality of these rocks, a lack of beauty will occur, and our vision and ingenuity will be replaced by a kind of imaginal hollowness and insubstantiality. In such a place paradox is pushed out of sight into the corners, hidden behind and beneath the marble. If this were true here, these sculptures would seem to be dead, superficial, inanimate and soul-less, but they are not. These objects bear witness to themselves in the image they offer, and their depth lies in the complexities of these images. To a large extent the art market has stopped listening to the deep complexity of images that fill the world. The art public have forgotten that it is crucial to listen to the materials of our planet as they tell their stories. I am not saying that rocks or objects feel, that they are inhabited by spirits, I am talking about them from the point of view of our psyche, our imagination. The eminent psychoanalyst, Carl Jung, believed that psyche was not only experience, it was also a sensual image. He understood that things present themselves in their images, that psyche is image and imagination, not just experience. In which case, these sculptures are not simply passive beneath our gaze, because imagination is pre-eminently in them, not inside us. So, coming to Yemisi’s sculptures I must be careful; I will not attempt to claim them. Taming and naming them will make them powerless. I do not wish to drag them safely into my world, rather I want to follow them into the mysterious depths of their world. Because I approach these sculptures as stones that invite me to redefine myself as a participant in an imaginatively alive world, I hardly want to connect them to the commercial art world, for this is a market that all too often seems intent on celebrating objects that are made to eulogize the frivolous, create shock or cause disorientation and disconnection. For this reason, I like to imagine these sculptures in a natural setting rather than in the gallery and I want to gaze at them intimately to discover how Yemisi might have chosen her stones, how they inspired her subject and how she has sculpted them in total sympathy with the contours and spirit of the stone. Another thought I have is that these sculptures connect with a spirit that is close to an Eastern notion of aesthetics. In the East, they have a conception of proportion that is completely different to European notions of mathematics and geometry. Their sublime relationships concern the ratio of order to chaos; something that can be seen in their finest gardens. 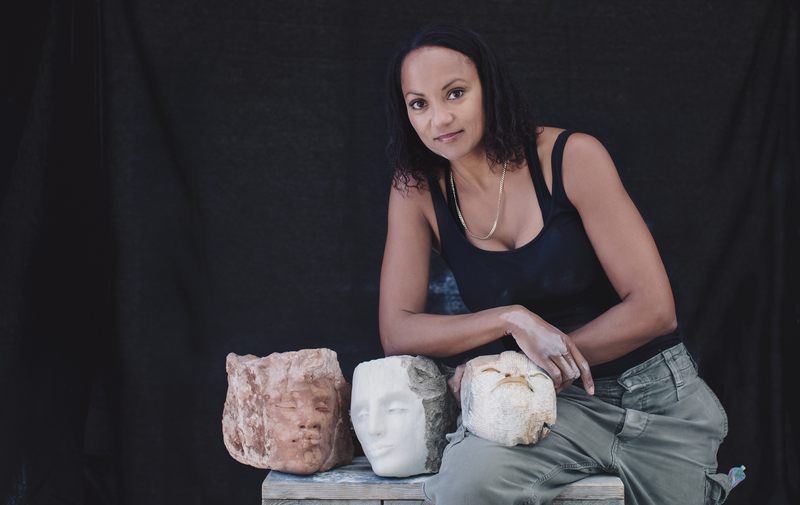 Armed with this knowledge, it is possible to appreciate in Yemisi’s sculpture a similar profound proportion, that between the meticulously sculpted and the rock which is untouched. For me, this relationship is beautiful, profound and deeply meaningful. Because of this active and passive relationship, these works inspire us to move and approach them in a very particular way. They have a front and a back and sides that are distinct, each highly articulated and in a very particular relationship. This also leads me to consider the process of their making; how Yemisi dreams them. We know something about how the great renaissance sculptors worked from Giorgio Vasari, a sixteenth century Italian painter, architect, writer, and historian, who famously wrote a book called ‘The Lives of the Most Excellent Painters, Sculptors, and Architects.’ He talked about sculpture as evolving through a process of subtraction. Addition, he says, has to do with painting and other art forms, but subtraction is the primary activity of the sculptor’s art and it is the sole domain of sculpture. This preoccupation with subtraction did not prevent sculptors from clarifying their thoughts on paper. From pen and ink sketches or black and red chalk drawings they often made small models in wax or clay and these devices helped them solidify their ideas. They keep these next to them while they chiselled at their stones, but they rarely refered to them. It is the activity of subtracting stone from stone that defines these artists and I imagine this is also true of Yemisi’s approach. If we look at someone like Michelangelo, and in particular the unfinished slave sculptures, we realise that his way of sculpting isn’t to work around his figure while he sculpts; he tackles it from one side only. He has a vision of the whole, but he starts with what he regards as the front of the marble block and then peels the figure out of the prison of the stone. Vasari asks us to imagine we are gazing at a figure lying horizontally in the bath and we see it rise up slowly until it is above the surface – this is how Michelangelo’s figures emerge out of the marble. The most protruding parts emerge first, showing the figure in relief and only when it is fully out of the water can you see it in its three-dimensional roundness. He starts by drawing the outline of his figure on the face of the marble and then, using mason’s strokes he takes up his punch and begins to define its structural forms. After this he takes the coarsest of his claw chisels and begins to give life to his forms. Finally, with ever-finer chisels, he repeatedly visits the surface until the subtractive process is complete. In the end he uses abrasives to smooth away the marks of the chisel and then polishes the complete figure to make it shine. If you look at his figures from a distance they appear to be complete, but if you move in closer you can see that some areas have not been touched since they were formed by the punch. In fact, if you attend to the sculptures closely you can see in various parts of the final figure examples of all the stages of Michelangelo’s chisel work. All of these issues can be experienced when gazing into Yemisi’s sculpture. It is certain that she imagines the features of her heads as projections of internal volumes rather than a collection of planes and surfaces. They do not work on the surface, they grow from inside out, just as life itself does. And when we consider the skill and love that breathes life into every detail we cannot help but feel that these sculptures have reality at every point of their conception. They are an extraordinary achievement.